WHAT’S THE PATTERN. 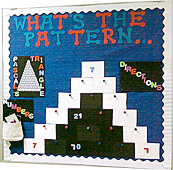 . .
Brooke Markle To obtain a downloadable copy of the worksheet that accompanies this bulletin board, click on the button below. INTERACTIVITY: Students will be provided a copy of Pascal's triangle. They will need to complete the number triangle on the board. There will be push-pins in each block that needs to be filled in with a number. They will have a pocket full of different numbers they can pin up to the board. The students will have to copy their answers from the board to the worksheet. There are a few numbers filled in to assist the students. Look at Pascal's triangle and find one of the many different number patterns used in the triangle. Use the numbers provided in the white pouch and fill in the blanks in the triangle. Use the push-pins to hold the numbers in place. Fill in all the numbers that are not provided for you. Once you have all the numbers filled in, copy your answers to the triangle on the worksheet. Turn your completed worksheet into me with your name on it. TIME: Students should have some back round knowledge of Pascal's triangle, so they should only need 10 minutes. If the students have no knowledge about Pascal's triangle, they should be allowed 15 minutes. SPECIAL CONSTRUCTION: The background used was cloth. The letters were pre-created with sticky on the back, so they stuck on the cloth. The pouch used was a little girl's purse. Velcro was used to secure the purse to the board, so that students could remove number pouch. All of the lettering, number blocks, numbers and assignment holder were created using paper form. CREDIT: Students that correctly complete the worksheet will receive a “free homework” pass.